Basic Brewing Radio (BBR), a podcast I have listened to for more than four years, and Brew Your Own Magazine (BYO), a publication I have read for just as long, have joined forces to conduct homebrewing experiments. The concept is that homebrewing culture supports a fair number of theories that are spread through the community by word of mouth. Some of these theories are based on fact, at least partially, while others are better classified as "old wives tales." Using the large audiences between their media outlets, BBR and BYO decided to organize experiments to prove, or disprove, some of the theories. While the size of their data sets might not be statically accurate to the standard of academic journals, the trends they present are interesting and worth noting. The results of each experiment are published in BYO and discussed on a BBR podcast. The seventh BBR-BYO Collaborative Experiment seeks to answer the question "Do different styles of glassware really affect your perceptions of the beer that is in them?" Chris Colby, the editor of BYO, developed an experimental method that includes a surprising number of data points for the experiment. The experiment seeks to collect data on each glass used (volume, diameter, etc. ), perceptions of the beer in each glass, and even a method to count the bubbles. I received a Chimay chalice glass as part of a beer sampler I got for Christmas a number of years ago. 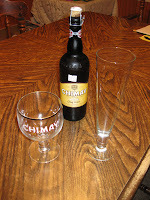 So, I elected to purchase a bottle of Chimay Cinq Cents (a tripel) to try it in the glass designed to go with the beer. To contrast the chalice, I selected the most different glass I own, a tall and thin pilsner glass. My wife and I sat down tonight to complete the experiment and our results are listed below. Our general impressions were that the chalice glass presented the best aroma, which was a light citrus character overlayed by a rich yeasty character. This could well be due to the wider beer surface that the chalice presented to our noses, compounded by the thicker pilsner glass head. The pilsner glass preserved the fine-bubbled beer head throughout the entire drinking session, while the courser chalice head dissipated within a few minutes. 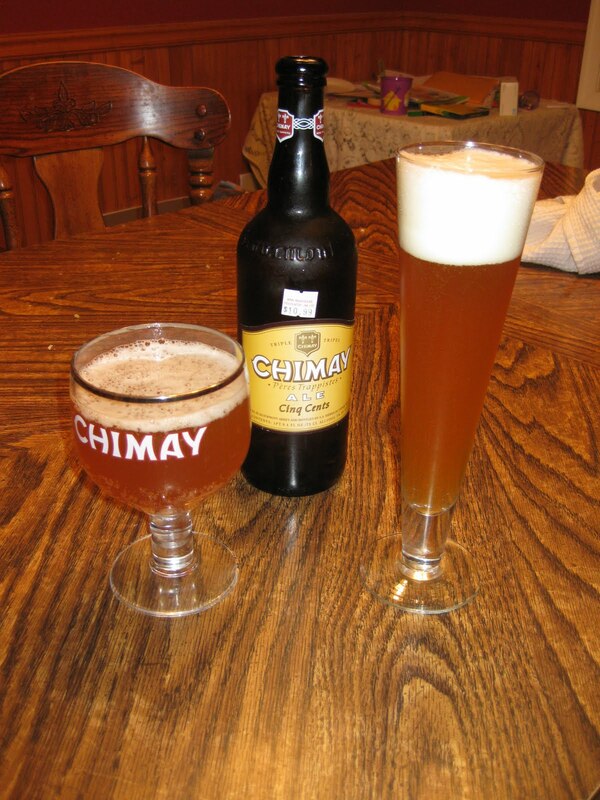 The beer color was slightly darker in the chalice glass, which makes sense given the thicker fluid column. The other notable difference was mouthfeel, which grew more distinct as the beer warmed. The pilsner glass developed a smooth rich mouthfeel that became almost silky at the end, while the chalice glass presented a courser more abrupt mouthfeel. In the end, both of us preferred the pilsner glass presentation over the chalice that was designed to serve the beer. 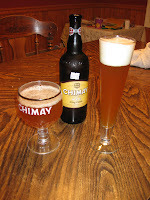 It was surprising how the different glasses impacted the beer, with everything except flavor differing between the two. I recommend you give this experiment, one of the quickest BBR-BYO Collaborative Experiments so far, a try and send your data along. The deadline for accepting experiment data is May 15, 2011. It will be interesting to see if this craft brewing/homebrewing theory is validated by our data.